How many types of drilling bits ? Currently in the drilling industry, there are two main categories of drilling bits: rolling cutter bits and fixed cutter bits. Plus, bit sizes vary from 3-7/8 inch to 36 inches. Rolling cutter bits, which some may also call roller cone bits or tri-cone bits, have three cones. 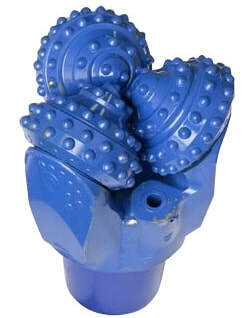 Each cone can be rotated individually when the drill string rotates the body of the bit. The cones have roller bearings fitted at the time of assembly. The rolling cutting bits can be used to drill any formations if the proper cutter, bearing, and nozzle are selected. Soft formation: The teeth should be long, slender and widely spaced. These teeth will produce freshly broken cuttings from soft formations. Hard formation: The teeth should be short and closely spaced. These teeth will produce smaller, more rounded, crushed, and ground cuttings from hard formations. Tungsten Carbide Insert (TCI) or Insert bits generally have tungsten carbide inserts (teeth) that are pressed into the bit cones. The inserts have several shapes such as long-extension shapes, round shaped inserts, etc. Fig. 2—Cutting actions for roller-cone bits. To understand design parameters for roller-cone bits, it is important to understand how roller-cone bits drill. Two types of drilling action take place at the bit. A crushing action takes place when weight applied to the bit forces inserts (or teeth) into the formation being drilled (WOB in Fig. 2). In addition, a skidding, gouging type of action results partly because the designed axis of cone rotation is slightly angled to the axis of bit rotation (rotation in Fig. 2). Skidding and gouging also take place because the rotary motion of a bit does not permit a penetrated insert to rotate out of a crushed zone it has created without causing it to exert a lateral force at the zone perimiter. Both effects contribute to cutting action (Fig. 2). Fixed cutter bits consist of bit bodies and cutting elements integrated with the bit bodies. 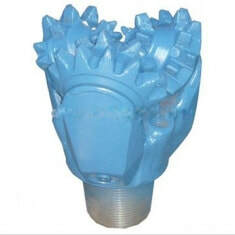 The fixed cutter bits are designed to excavate holes by shearing formations rather than chippingor gouging formations, like rolling cutter bits. These bits do not have moving parts such as cones or bearings. The components of bits are composed of bit bodies fabricated from steel or tungsten carbide matrix and fixed blades integrated with abrasion-resistant cutters. The cutters in the bits that are available on the market are Polycrystalline Diamond Cutters (PDC) and natural or synthetic diamond cutters. Nowadays, with the improvement that have been made in fixed cutter bit technology, the PDC bits can drill almost any kind of formations from soft to hard formation. However, if you plan to drill very hard formations, you might consider using diamond bits instead. PDC bits drill primarily by shearing. Vertical penetrating force from applied drill collar weight and horizontal force from the rotary table are transmitted into the cutters (Fig. 2). The resultant force defines a plane of thrust for the cutter. Cuttings are then sheared off at an initial angle relative to the plane of thrust, which is dependent on rock strength. Fig. 2—Shear and thrust on a cutter. 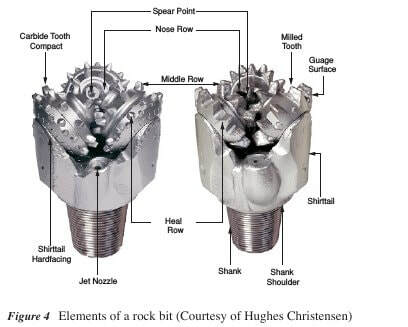 Formations that are drillable with PDC bits fail in shear rather than compressive stress typified by the crushing and gouging action of roller-cone bits. 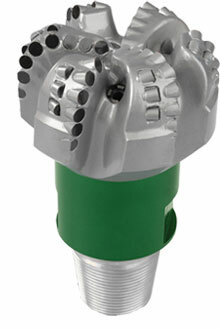 Thus, PDC bits are designed primarily to drill by shearing. In shear, the energy required to reach plastic limit for rupture is significantly less than by compressive stress. PDC bits require less weight on bit (WOB) than roller-cone bits. Thermally stable PDC cutters are designed to plow or grind harder formations, because of their thermal stability and wear resistance. This grinding action breaks cementing materials bonding individual grains of rock.